Total War: Attila - Factions Guide - In Total War: Attila we will face for the first time a choice: to become the great Roman Empire, or try to destroy it? After many releases in which we tried to get the better of the "barbarians". In Total War: Attila there is indeed a chance to play with as many as 10 different factions, each with its own characteristics and, above all, with its objectives. Imagine that, in the face of such great abundance, a new player, but why not, an expert used to playing with the other chapters of Total War, you can find crowded out and do not know which side to start with. Our guide will help you to understand the uniqueness of each faction and to choose the one that best suits your style of play. The Franks: Far from the dangers of invasions, the main objective of the Franks is detached from the Roman Empire. We must take advantage of the difficult time of the Romans and choose from the invasion to the south or the north towards the Britannia. Manage the Franks will not be easy, for this faction is recommended for those who already have a lot of experience of war and has already played other chapters of the franchise because the game mechanics are very similar. The Saxons: The Saxons living at a safe distance from the two empires and have the freedom to move around as they wish. Their greatest enemy is the cold that threatens to decimate the troops and the population, but in terms of diplomatic there will be few problems: everyone will be at war with you but no one will be a real danger. This faction is ideal for those who enjoy freedom of movement and to have a more traditional style of the game. Perfect for those who come from Total War: Rome II and gradually want to test the innovations of this output. Alans: The Great Danes are one of the populations most known for their cruelty in battle. Prefer to conquer and destroy rather than build. Alans, however, were forced to succumb to the Huns and were faced with the choice to prostrate in front of the Roman Empire and the Vandals, Huns, or join the hunt for loot. The campaign begins on the Black Sea, in the heart of the horde of Huns: what choice you will take? Alans are recommended to those who want groped mechanics hordes right now, love the fighting (and in this case helps the presence of some of the strongest units in the game), but aware that the challenge will be the most difficult of all. The Ostrogoths: Located between the Baltic Sea and the Black Sea, have the misfortune to be right now in front of the Huns and Alans, but must watch their backs also by the Roman Empire of the East. A strong leader, however, allows little corruption and good bonuses military. Playing with the Ostrogoths means having to do with a level of difficulty medium, in which you spend more time fighting than to manage the empire, but in which also weighs a certain component diplomatic relations with the Romans. The Vandals: Abandoned in times of need from their friends Romans, the Vandals must find happiness by moving to South. Coexist peacefully with the Romans, but must contend with barbarian troops which have torn the earth, first of all the Pannonians. With the arrival of the Huns, the Vandals are among the first people forced to emigrate, and thus also to make his way by force between the lands already occupied. Even this faction is only recommended for users who have some experience of the game and want to test almost immediately the novelty of migration. The Visigoths: The Visigoths are among the worst enemies of Rome. They have vowed to take revenge against the Empire for the many damages suffered from decades of occupation. Playing with the Visigoths will be difficult because you find yourself between two fires: the Romans in the West and the Huns in the East. The good thing however is that almost all the barbarian factions are friends. The main objective of the Visigoths is to combat the Eastern Roman Empire, but with the advance of the Huns priorities may change. The faction of the Visigoths is recommended for those players who are interested in exploring the new mechanics of the hordes and who are looking for a moderately high level of challenge. The Huns: The most awaited faction, that of the great Attila. Their arrival is preceded by a great fear on the part of all the factions, well aware of the power of the army Hun. They have the strongest army of the game, but also the handicap of not being able to count on buildings and villages to replenish its finances. The only thing you can do with it ... the Huns attack. The faction of the Huns is therefore recommended to those who want to destroy the world (virtual of course), he wants to fight seamless and wants to be the force that governs the game. Depending on what you decide to do we will develop, or will self-destruct, the largest empires in history. Western Roman Empire: The Roman Empire is crumbling. It has already been divided between East and West and some factions, as the Vandals and the Franks, seeking independence. The division will not bring war but economic difficulties. Difficulties to be faced with the knowledge that the barbarians can attack at any moment. Also, when the Huns will become powerful enough (very far with the game to be honest) we will face them too. The challenge is very experienced players: you will start it with strong economic problems and have to juggle the lack of gold and the barbarian hordes that push from the North. Those who choose this faction already knows he'll be almost always at war and will have to manage a large empire. This is the most difficult challenge to win, only for those who have already tried 2-3 times minimum the game with other factions. Eastern Roman Empire: The Eastern Roman Empire was born from the split of the great Roman Empire that no longer recognizes itself in the authority of Rome. While leading to a split, however, the two sides do not make war but agree to cooperate against outside invaders. The new capital was Constantinople, and all taxes and income end up there and no longer in Rome. Our job is primarily to keep the Western Roman Empire safe from migration of Eastern barbarians. We will negotiate with menacing barbarians, but also have to deal with court intrigues and the ever-present threat Sassanid who declared war on Rome. Unlike the "cousins" of the West, the Eastern Empire is rich and can have important resources, thanks to the commercial benefits with Rome. Benefits paid dearly because hordes worst will come just from the East. With this framework, it becomes clear that the Eastern Roman Empire is more suitable for players who already have some experience with not only the franchise, but they have already played more games in Total War: Attila. The challenge in fact be difficult and must be able to handle large empires. The Sassanid: The Sasanian empire is one of the last great empires of antiquity. There were many factions that have guided, which meant that the empire was expanding significantly, and that flourish in business. But now comes the threat of the Huns and this peace, bruised by the Empire of the West, is short-lived. The Sassanids are among the troops most recommended for a user to the first test because they are rich and have since the beginning of many troops. The people are educated and therefore we will also have a bonus in research and state of health. 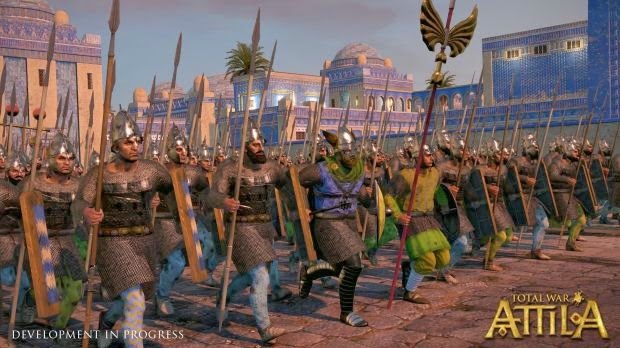 The Sassanids are also recommended for those who like to manage large empires and prefers to explore the game without the worry of war and disease.